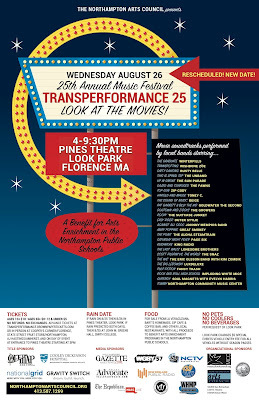 Unfortunately due to a rainy weather forecast our normally scheduled date for Transperformance 25: Look at the Movies! has been rescheduled to our rain date of Wednesday August 26 at Pines Theater-Look Park. We apologize for any inconvenience this may cause. 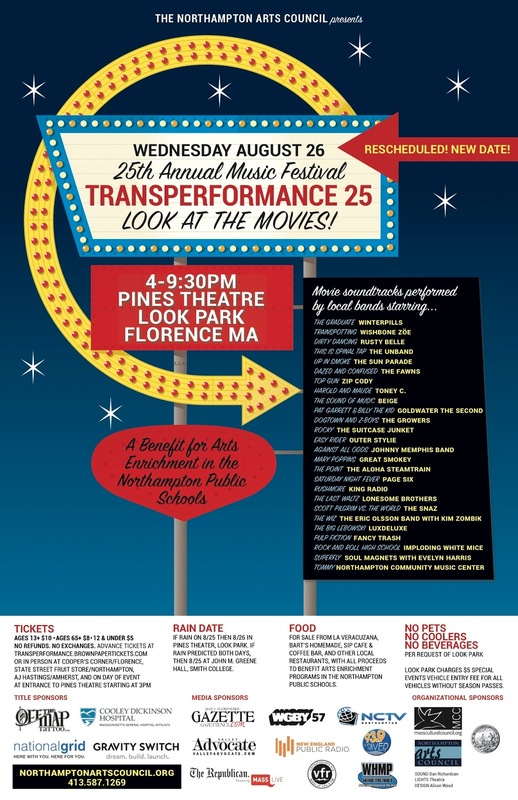 It’s time to celebrate our community and the arts with Transperformance 25: Look at the Movies! Tuesday, August 26, 2015 at Pines Theater in Look Park Florence, MA. It’s the Transperformance Silver Anniversary and what better way to celebrate than to feature music from the Silver Screen. This year, our Valley’s favorite benefit music festival features local sensations Winterpills, The Unband, Lux Deluxe, Rusty Belle, The Lonesome Brothers, and many more! The bands will perform songs from the soundtracks of The Big Lebowski, This is Spinal Tap, The Sound of Music, Saturday Night Fever, Easy Rider, and Rocky as well as take on the personas from characters in the films. Northampton notables Monte Belmonte, Joshua Braska, Steve Sanderson, Johnny Memphis, Joan Holliday, and Julie Waggoner will host as celebrity personalities. Food will be available from La Veracruzana and Bart’s Homemade as well as pizza from local restaurants. No pets, no coolers and no beverages please, per request of Look Park. Look Park charges a $5 special events vehicle entry fee for all vehicles without season passes. Harold and Maude starring TONEY C.
It was 25 years ago the Northampton Arts Council created the first Transperformance: Woodstock The Performance Peace. Each summer the Northampton Arts Council and the Parent Teacher Organizations of Bridge Street School, Leeds Elementary School, RK Finn Ryan Road Elementary School, Jackson Street School, J.F.K. Middle School and Northampton High School join forces to raise funds for arts enrichment in the schools and the ArtsEZ grant program. Last year Transperformance 24: Off the Map was attended by over 2,000 people and provided $1,500 to each school due in part to the dollars raised by donors like you. The money goes toward great projects in our local schools, like JFK Middle School bringing WOFA Drum and Dance Interactive performance to their students. The Northampton Arts Council raised an additional $15,000 that was recently distributed during the ArtsEZ grant round where local artists, schools, and arts organizations receive funding to produce arts events in Northampton, Leeds, and Florence.